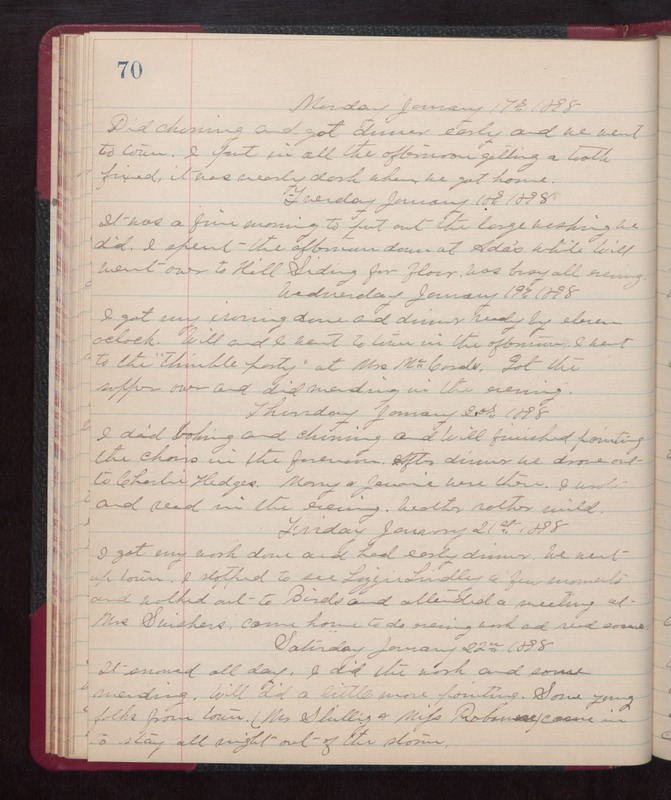 Monday January 17th 1898 Did churning and got dinner early and we went to town. I put in all the afternoon getting a tooth fixed, it was nearly dark when we got home. Tuesday January 18th 1898 It was a fine morning to put out the large washing we did. I spent the afternoon down at Ada's while Will went over to Hill Siding for flour. was busy all evening. Wednesday January 19th 1898 I got my ironing done and dinner ready by eleven oclock. Will and I went to town in the afternoon. I went to the "thimble party" at Mrs McCords. Got the supper over and did mending during the evening. Thursday January 20th 1898 I did baking and churning and Will finished painting the chairs in the forenoon. After dinner we drove out to Charlie Hedges. Mary & Jennie were there. I wrote and read in the evening. weather rather mild. Friday January 21st 1898 I got my work done and had early dinner. We went up town. I stopped to see Lizzie Lindley a few moments and walked out to Birds and attended a meeting at Mrs Swishers. Came home to do evening work and read some. Saturday January 22nd 1898 It snowed all day. I did the work and some mending. Will did a little more painting.Some young folks from town (Mrs Slullig & Miss Robonese came in to stay all night out of the storm.